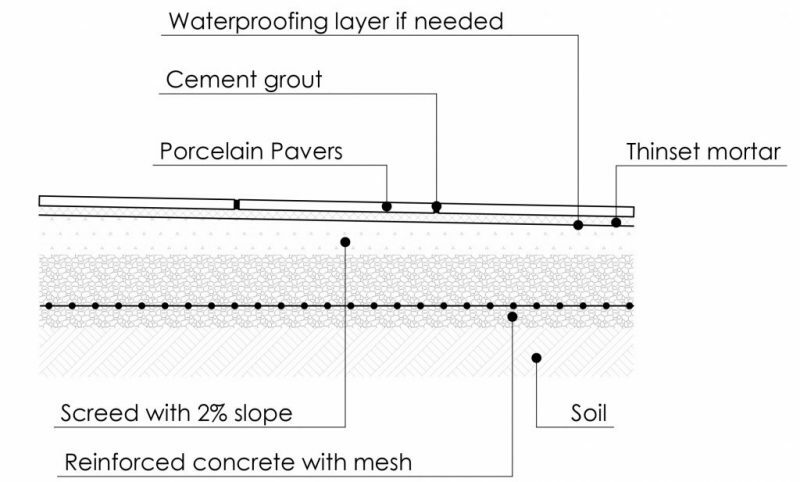 The versatility and strength of porcelain pavers enables them to be laid on an exceptionally wide range of surfaces, not only with adjustable height pedestals for constructing elevated decks and rooftop decks, but on concrete beds, over sand or gravel or laid over existing concrete surfaces or wood decks. Brief installation notes for different surfaces are given below. Where the surface may be sloping or uneven, or where a perfectly horizontal surface is required on a rooftop deck, pavers can be installed on adjustable height pedestals with pedestals situated on each corner of the paver. For more information on installing porcelain single slab pavers on adjustable height pedestals, see here. 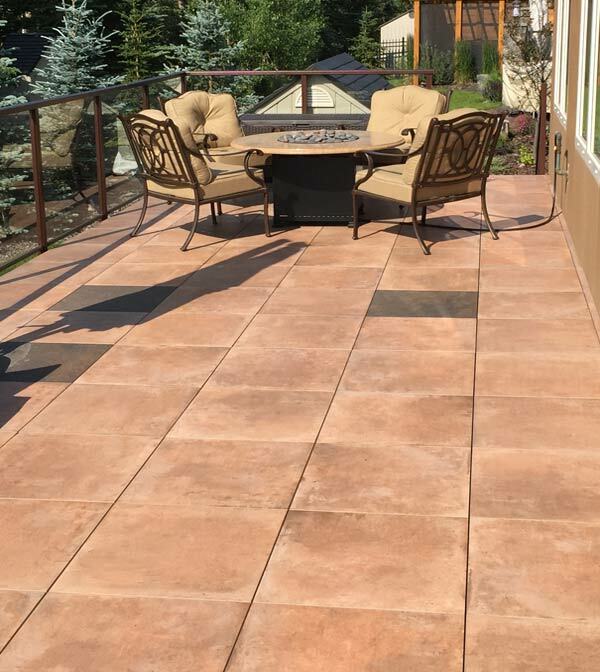 Porcelain pavers can be installed directly over existing concrete such as patios, balconies or rooftops without the need for mortar, thinset or grouting. The area to be paved should be surrounded by low retaining walls or other restraining structures to restrict any lateral movement of the tiles. To compensate for any slight unevenness in the concrete slab or deck and to provide accurate spacing between the pavers, plastic paver support pads (1/2″ to 1″ high) with inbuilt spacer tabs are placed under each corner of the pavers to raise the pavers off the surface. If required, additional shims can be installed under the mounting disks to reduce noise transmission and provide added shock absorption. On stable and hard ground, dig down to a depth of approx. 6″ and level the surface. Lay the pavers onto a bed of concrete (using a relatively dry mix). Ensure that the surface of each paver is level and that constant joint widths are maintained between pavers using spacers as necessary. Fill in the joints between the pavers with mortar using a trowel. The area to paved should ideally be dug to depth of 10”- 14” and enclosed within a border of wood planks or other solid material to create a restraining boundary. Fill the dug area to a depth of 6”-8” with mixed gravel and crushed rock and then add a second 2”-4” layer of sand. Both layers should be well compacted. Lay the pavers over the top of the sand using 1/8”-3/16”spacers between the pavers. For best results, the use of plastic mounting disks placed at each corner of the pavers is recommended. Start by removing the grass and dig to a depth of around 8”. Remove the earth and spread it along the sides of the area using a rake to create a long, low layer. Install wood planks or other solid material around the area to be paved and extending above the leveled earth by about ½”. Fill the dug area with 4” of compacted pebbles and cover with a 4” layer of gravel. Lay the pavers on the prepared surface using using 1/8”-3/16”mm spacers between the pavers.